Today Google Assistant Product Management Director Lilian Rincon announced several new features for its AI-based digit assistant known as Google Assistant — which is built into a wide variety of devices ranging from smartphones, tablets, smart speakers, etc. These features will be rolled out in the coming weeks. The Google Assistant feature allows you to check in on your family at home through a feature called broadcast. Through broadcast, you can send messages from your phone to smart speakers and smart displays at home. And now Google is adding the ability to reply back from a smart speaker or Smart Display to your phone. Once the reply is received on the phone, a notification will pop up with a transcription of the message. And you can respond with text or by voice with Google Assistant. This feature will be added across all smart speakers and Smart Displays in the coming weeks. Soon you will see a Recommended Recipes card on the home screen of Smart Displays such as the Google Home Hub, Lenovo Smart Display or JBL Link View. This comes in handy while you are browsing recipes and getting step-by-step cooking instructions. 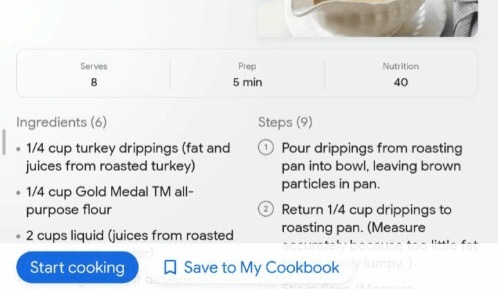 The Recommend Recipes are based on recommendations for recipes that are similar to the ones you have searched for in the past. And recipes will be regularly updated with smart recommendations based on the nearest meal time and whichever season it is. Once you see a recipe that you want to try in the future, you can save it and view it in a personalized cookbook. This feature will be rolled out across all Smart Displays in the coming weeks. It can always be a challenge to form habits like picking up after yourself, starting your homework, or making the bed. Google is making this process more fun by setting up an alarm from popular animated characters with the Google Assistant on smart speakers. The new alarms will feature signature music, jokes, facts, and motivational sayings from characters in LEGO City, LEGO Life, and LEGO Friends and from Nickelodeon’s Rise of the Teenage Mutant Ninja Turtles. So you can say “Hey Google, set a Teenage Mutant Ninja Turtle alarm for 5:00 PM.” And Google will soon add characters from Spin Master’s Hatchimals later this year. Plus a new Storytime feature is being added for Google Assistant called Read Along that makes it possible to bring your smart speaker to life with sound effects and music as you read along with books. 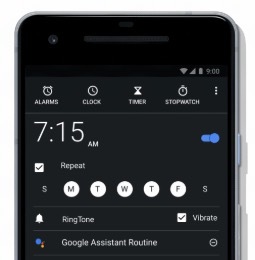 Google is adding Routines to the Clock app for Android devices. And once you dismiss your alarm, the Google Assistant can start a routine such as telling you the weather and traffic on your work commute along with starting the coffee maker. The routines can be customized through the Clock app itself.